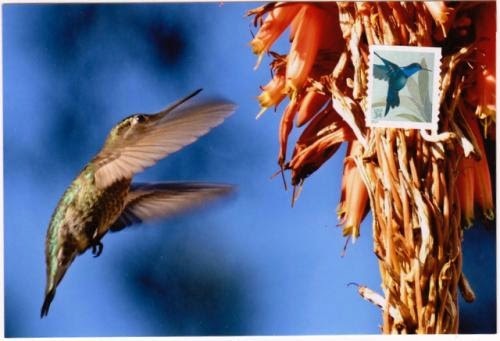 Postcard US-2738805 to Ireland shows a Immature Anna's Hummingbird from a Flickr photo Fun With Hummingbirds Today by Linda Tanner under a Creative Common 2.0 license with attribution. The photo was taken on January 23, 2011. Cancellation Services, 8300 NE Underground Drive, Pillar 210, Kansas City, MO 64144-0001 for a first-day-of-issue postmark.